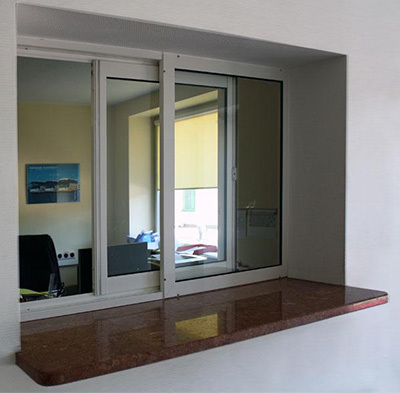 We offer service windows used in: cashier desks, pharmacies, porter’s lodges, reception desks, storehouses etc. The windows might be slid vertically or horizontally. A lifted window might be fit with an actuator maintaining the lifted part in every position; lifting such part requires little external force. We use Copal system profiles to manufacture them. We offer glazing with safety glass and burglar-proof glass. The surface of the profiles might be secured using the anodising method or the powder painting method, which offers infinite choice of colour.